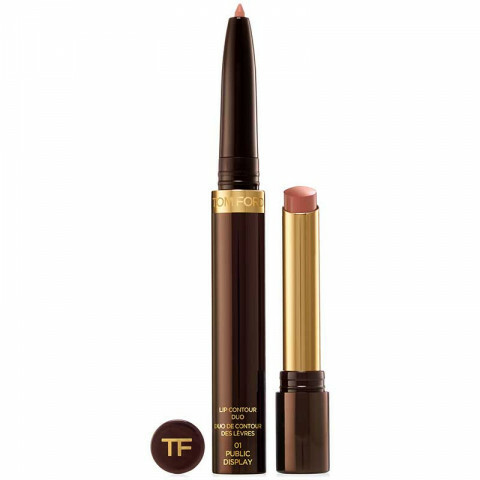 Tom Ford innovation meets lip artistry with a dual lip color and shaping tool. On one end, the slim and sleek pencil features a lip shaper to enhance and define lips. On the opposite end is a full-coverage, slim stick lip color concealed inside. Use the lighter shade of lip shaper together with the deeper lip color to add dimension, shape and create an ombre effect to your lips, from subtle contour to high-definition contrast. This product is very convenient and travel friendly. The shades and formula are stunning. Dream obscene is a gorgeous cool toned pink. Very nice color to wear in the spring. Love the formula. I love that this duo comes with a liner. It makes application so much easier! These are very creamy and pigmented. Love it! Love the color and formula of the product and it applies well.